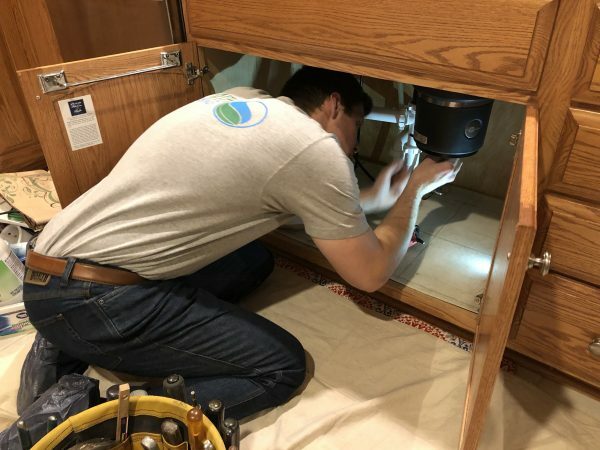 Are you looking to upgrade to a new quieter disposal? Smith Plumbing, located in Pierre, SD, is ready to help. Call or text us today at 605.222.4770 or use the request service form below and we will find a solution for you. Ask anyone who has a garbage disposal. They will tell you that they can’t imagine life without it. With a premium disposer you can scrap most food items into the sink and not worry about clogging the drain. A quick trip through the running waste disposal with a flush of water and they are gone. Disposal is not working. If you have a batch-feed unit, verify that the disposal’s sink stopper is in place. It could be that the disposal or the circuit breaker needs resetting. You might need a new disposal. Something has jammed the blades. We can clear most jams. We can also help you understand what items should not go into the disposal. Just remember that you should never run the waste disposal without the water running. If you do, the blades will heat up and the unit will jam. Water keeps the blades cool and somewhat lubricated. Also, let the water run a few moments after turning it off. The extra water gives the waste a chance to exit the disposal and enter the drain. The disposal is leaking. Water drains from your sink, into the chamber and out to a drain in the space beneath the sink. It’s possible that vibration has shaken something loose. We are great at fixing leaks. It makes a humming noise. The humming may indicate a clogged pipe that we can clear. It makes other strange noises. It could be that there is something inside that doesn’t belong. It could also be that the unit is failing. We can check it out and see what is wrong. Are you ready for a garbage disposal upgrade? Smith Plumbing, located in Pierre, SD, is ready to help. Call or text us today at 605.222.4770 and we will install one for you. You can also reach us through our online contact form.